There is a fully funded PhD studentship with supervision by Professor Adrian Smith and myself at Queen Mary University of London School of Geography. Please click here to apply! Do global value chains lead to forced labour? Malaysia is a country which has experienced tremendous economic growth from the 1970s onwards, moving to upper-middle income status in the mid-1990s (Felipe 2012). One of the key industrial sectors that led its transition out of an agrarian society to an industrial one was the electronics industry. Malaysia was one of the first developing countries that inserted itself into the vast global value chain of the electronics industry. Malaysia was one of the earliest locations where multinational corporations established offshored factories in the country’s free trade zones in the early 1970s. This led to a creation of a set of domestic firms, which specialised as suppliers of parts and components to a large number of multinational corporations in the country. While there was significant growth and some upgrading during the 1980s, the industry and importantly domestic firms have experienced stagnation since the late 1990s. The electronics industry in Malaysia has been unable to upgrade further and move up the global value chain (in value added terms) for many years (Rasiah et al 2015). Critically, it faces competition with new production locations such as Viet Nam and India. A major reason behind the failure of the electronics industry in Malaysia to grow further is its deep embeddedness in the global value chain. Malaysia entered the electronics industry global value chain with very little domestic capability of its own. Rather, the industry was created with an excessive openness to foreign investment and multinational corporations. Multinational corporations did not only bring production to Malaysia, they also brought with them a set of interests, which were taken up by the Malaysian government as policies, to maintain the industry as low cost and labour intensive. One of these policies has been the maintenance of low wages in the industry. As the Malaysian economy grew and wages rose during the 1990s, domestic workers were no longer interested in the low paid factory jobs offered by multinational corporations in the electronics industry. The solution to this problem, which was backed by large multinational corporations with large factories in the country, was an influx of low paid foreign workers. Today, foreign workers are a significant feature of the electronics industry in Malaysia. While there are no exact numbers, there are estimates that up to 60% of the workforce in large factories are foreign workers (personal interview 2015). The majority of these workers hold temporary contracts and are hired by labour agencies, which are poorly regulated and whose networks are not transparent (Simpson 2013). The demand for low paid workers, has also, tragically, led to a high incidence of forced labour (Verite 2014). In its damning report, which was commissioned and funded by the United States Department of Labor, Verite (2014) found that a third of the 501 workers it interviewed were in a situation of forced labour. This report raises serious questions about how an upper middle-income country which hosts major electronics firms with global reputations, such as Intel, Hewlett-Packard, AMD, and Motorola (note: the report does not name which firms were found to have forced labour), has found itself in a situation of forced labour amongst its foreign workers. It also raises questions of how global value chains are implicated in the incidence of forced labour. For Malaysia, there are various factors at play. An excessive openness to foreign investment has led to the inability of domestic firms to upgrade in the electronics industry. The large and significant presence of multinational corporations has essentially led to a crowding out of domestic innovation and capabilities. More significantly, multinational corporations in Malaysia are interested in maintaining the production location as low cost and labour intensive as possible (Raj-Reichert 2016). While this would normally contradict with characteristics of an upper middle-income country, Malaysia has, however, artificially maintained low wages with the influx of foreign workers (Malaysia is reported to have the largest number of foreign workers in South-East Asia (The World Bank 2013)). This is being done through a network of labour agencies that are poorly regulated, largely non-transparent, and which have historical roots of informal worker recruitment dating back to the 1970s (Chin 2002). The combination of a fast paced order and delivery schedule of the electronics industry global value chain and government policies, that have failed in innovative upgrading and that have resorted to maintaining a large multinational corporation dominated low cost labour intensive industry, are significant factors which have led to forced labour in the electronics industry in Malaysia. Chin, CBN (2002) The ‘host’ state and the ‘guest’ worker in Malaysia: Public management and migrant labour in times of economic prosperity and crisis, Asia Pacific Business Review, 8 (4), 19-40. Felipe, J (2012) Tracking the Middle-Income Trap: What is it, who is it, and why? Asian Development Bank Economics Working Paper Series. Raj-Reichert (2016) ‘How global value chains contribute to the middle-income trap: a case study of the electronics industry in Malaysia’, Presentation at ‘The Political Economy of the Middle-Income Trap: Towards “Usable” Theories in Development Research” 24 February 2016, King’s College London. Rasiah, R, Crinis, V, and Lee, H-A (2015) Industrialization and labour in Malaysia, Journal of the Asia Pacific Economy¸ 20 (1) 77-99. Simpson, C. (2013) ‘An iPhone tester caught in Apple’s supply chain’, Bloomberg News.http://www.bloomberg.com/bw/articles/2013-11-07/an-iphone-tester-caught-in-apples-supply-chain#p1 (accessed 9 September 2015). Verité (2014) ‘Forced labor in the production of electronic goods in Malaysia: A comprehensive study of scope and characteristics’. Amherst: Verité. World Bank (2013) Migration and remittance flows: Recent trends and outlook, 2013−2016, Migration and Development Brief 21, Migration and Remittances Team, Development Prospects Group (Washington DC). The role of large transnational first tier suppliers in global value chains (GVCs) is changing. Rather than the conventional image of relatively powerless suppliers facing giant global brands, large first tier suppliers are emerging as powerful players in their own right. This is seen in a variety of global industries such as electronics, garments, and agro-food chains (Azmeh et al. 2015). Yet, there is little research on the rise of large first tier suppliers and what it means for the governance of GVCs (for exceptions see Applebaum 2008; Gereffi 2014; Azmeh and Nadvi 2014; Merk 2012). Large first tier suppliers can change power relationships and dynamics vis-a-vis brand firms thereby upsetting traditional ideas of “lead firms” in the GVC literature. With increased capabilities in production, chain organization, technology and innovation, and financial might, large first tier suppliers are shaping their own roles within GVCs and outcomes for participating countries, firms, and producers. In some cases, such as in the garments industry, large first tier suppliers have established new GVCs and emerged as brand firms in emerging markets (Azmeh et al. 2015). Their business strategies can impact entry and upgrading opportunities and prospects for second or third tier suppliers as is the case for example in export-oriented garment industries in Sub Saharan Africa (Morris and Staritz 2014; Morris et al. 2015). In agro-food chains, such as the cocoa and coffee industries, large first tier suppliers have changed the dependency equation between buyers and suppliers leading to bi-polar governance structures in GVCs (see Fold 2002; Talbot 2002; Kaplinsky 2004; Ponte and Daviron 2005). Further, powerful international traders can complicate governance structures for example via financial markets in agro-food and commodity chains more generally (see Staritz et al. 2015). First tier suppliers’ increasing control over the organisation of GVCs has also implications on labour and environmental governance within global industries. For example, large first tier suppliers in the electronics industry are increasingly accused of labour violations and have become increasingly implicated in labour governance measures and compliance mechanisms (see Raj-Reichert 2011). These examples support ideas around multi-polar governance that extend beyond brand firms in GVCs as has been recently discussed by Ponte and Sturgeon (2014). We are planning to organize two panels as part of Research Network O – Global Value Chains at SASE 2016. If you are interested in participating in a panel, please send an abstract no longer than 500 words to Shamel Azmeh (c.azmeh@lse.ac.uk), Khalid Nadvi (khalid.nadvi@manchester.ac.uk), Gale Raj-Reichert (gale.reichert@manchester.ac.uk), and Cornelia Staritz (c.staritz@oefse.at) by 31 January 2016. Please note that we are aiming for abstracts suitable for a journal special issue. Therefore, we also request full papers (in draft form is acceptable) no longer than 10,000 words including references to be submitted to the organisers before 1 May 2016.
hIn recent years, there have been numerous labour violations in the global electronics industry. They include factory worker suicides, forced labour, child labour, excessive over-time, poisonings, illnesses, and deaths from chemical exposure. Many of these violations occur in supplier factories of big brand companies such as Apple, Hewlett-Packard, and Dell. While brands are considered ultimately responsible for these violations, their efforts to improve the situation are more often than not inadequate and unsustainable (Locke, 2013). The crux of the problem lies in the just-in-time production model that involves brand firms demanding fast and cheap, yet high quality outputs from suppliers in the electronics industry. While suppliers tend to have little bargaining power against these demands by brand firms, the notion of ‘powerless’ suppliers does not fully apply to a set of large and key suppliers in the electronics industry – contract manufacturers. Contract manufacturers are large multinational corporations with an extensive and growing set of capabilities in production, supply chain management, customer management, design, engineering, and others. According to the European Commission, the top five contract manufacturers (see Table 1) in the industry conduct up to 80% of manufacturing for brand firms. Table 1. Top five CMs compared with the top five brands in the electronics industry. Sources: Fortune 500, 2014 (http://fortune.com/fortune500); Lenovo (2015); http://investing.businessweek.com/research/common/symbollookup/symbollookup.asp; www.google.com/finance (accessed 17 June 2014); https://www.linkedin.com/company/asus, accessed 12 June 2015; http://www.bloomberg.com/research/stocks/financials/financials.asp?ticker=2353:TT&dataset=incomeStatement&period=A&currency=US%20Dollar; company websites. Brand firms maintain long-term relationships with these contract manufacturers (see Table 2). As relationships between brand firms and contract manufacturers mature, and as contract manufacturers increase their own resources, activities, and capabilities in corporate social responsibility, this group of suppliers should be looked at as entry points for changing labour governance practices in the industry – notably by pushing back against brand firm business practices that result in labour violations. Table 2. Brands with which CMs had greater than 10% net sales (A) or greater than 10% net revenue (B). Source: Company SEC 10-K filings. More attention needs to be paid to these contract manufacturers because they own, run, and manage the largest factories in the industry and employ a large number of workers. Their factories and workers are mainly located in developing countries where risks of labour violations are the greatest. As a result, contract manufacturers must be compelled to exercise more leverage over labour governance negotiations within the industry. This will require engagement and pressure by non-governmental organizations, trade unions, and governments to create risks and obligations for contract manufacturers to exercise more power over labour governance for example by establishing a collective ‘floor’ on labour costs and working conditions which can be used in the bidding process with brand firms. These issues are explored in more detail in my article ‘Exercising power over labour governance in the electronics industry’ in Geoforum. on the ground, and how to improve local outcomes. perspectives on the research challenges that lie ahead. Click here for the event poster. Many leading global brands, like Apple and Hewlett-Packard, source components from and have their products manufactured by a variety of independent suppliers. These suppliers undertake production in many locations across the world in vast global value chains. Ensuring that these suppliers meet international standards on labour, health and safety and environmental impacts is an increasing challenge for the global brands in the computer industry. These pressures are often accentuated by campaigning non-governmental organisations (NGOs), trade unions seeking to ensure better working conditions, and by governments keen to enforce public regulations. There has been substantial progress by the leading brands to engage with their first tier suppliers on such concerns. However, little is known about how labor standards and codes of conduct are addressed by second tier suppliers found at the lower tiers of global value chains, where the governance of labour conditions can be extremely challenging. Are private or public measures more successful in reaching suppliers down the global value chain? This question is addressed in a recent paper by Dr Khalid Nadvi and Dr Gale Raj-Reichert from the Institute for Development Policy and Management at the University of Manchester, “Governing health and safety at lower tiers of the computer industry global value chain” in the journal Regulation & Governance (the article is offered as open access and is free to everyone). The paper investigates whether, and how, occupational health and safety standards permeate down the computer industry global value chain. It does so by comparing first and second tier suppliers located in Penang, Malaysia and their engagement with a private voluntary industry code – the Electronics Industry Code of Conduct (EICC), and the publicly regulated European Union Directive on the Restriction of Hazardous Substances (EU RoHs). The EICC, which was developed in 2004, specifies guidelines for firm conduct and policies on labour, occupational health and safety, the environment, ethics, and management systems. The EICC is a voluntary standard and firms that comply with it are required to ensure their suppliers also implement it. The EU RoHS, which came into effect on 1 July 2006, limits the use of hazardous contents, such as lead and brominated flame retardants, in electronics goods of all electronic products sold in the European Union. The penalty for not complying with EU RoHS includes fines and the denial of market access to the EU. Both the EICC and the EU-RoHS directive have direct and potentially positive impacts on the occupational health and safety conditions of workers in factories that produce electronics goods. The study reported in the paper investigated a group of second tier suppliers in Penang, Malaysia and found that while none of them complied with the EICC code, the majority of them did meet the EU RoHS requirements. The second tier suppliers managed to comply with EU RoHS largely using their own resources with little or no assistance from other firms or the Malaysian government. Through case studies of different second tier suppliers the paper sets out to explain why these suppliers prioritized the EU RoHS over all other governance measures. The findings show that EU RoHS because of its mandatory legal stipulation made it a de facto market entry requirement for suppliers that were already plugged into global value chains linked to the European market. These findings raise important questions about the role of public regulation and public governance in improving labour conditions in global value chains. While there has been an emphasis over the past three decades on private standards and private measures for governing labour conditions in global industries, experience has shown these measures to have weak outcomes. When one travels further down to smaller suppliers in lower tiers of global value chains in developing countries, private labour standards can be altogether missing. This is often because small suppliers usually have weaker technical, managerial and financial resources. Moreover, many lower tier suppliers in the electronics industry are located in developing countries with weak government agencies and regulatory oversight over labour conditions. This was exactly the case of the second tier suppliers in Penang featured in the paper. For the majority of these suppliers, government agencies did not assist with the compliance of any type of private or public standards on labour conditions. The paper highlights a critical and important finding which suggests that mandatory standards directly tied to market access may be better able than voluntary private standards to penetrate down the global value chain to reach second tier suppliers. This signals the efficacy and importance of market access regulation over private voluntary initiatives in the most difficult places of global value chains. While market access standards (especially pertaining to labor and the environment) have been difficult to implement at a global or multilateral level (given World Trade Organization restrictions) there are however many examples that prove it is possible at the regional, national/bilateral, and even local levels. For example, China, Japan, South Korea, Turkey and California have all implemented their own versions of a RoHS. Moreover, market access standards can have harmonizing effects on an industry. Take the printed circuit board industry as an example. After the EU RoHS banned the use of lead, printed circuit board companies found it more expensive to operate two different types of manufacturing processes – one that uses lead for non-EU markets and one that is lead free, complying with EU RoHS, and destined for the EU market. Also, brands such as Apple and Dell now require all of their products globally to comply with EU RoHS. The findings of the paper support arguments for complementary public-private governance arrangements. Our findings suggest the need for policy actors and researchers to further investigate how to better integrate private regulation with public regulation and public enforcement in order to improve working conditions at lower tiers of the global value chain. Over the last two decades, the concepts of global commodity chains (GCC), global value chains (GVC) and global production networks (GPN) have become quite powerful analytical frameworks with which to explore the changing landscapes of economic globalisation and its associated developmental outcomes. Since their inception, a central concern has been with the governance of inter-firm relations and the asymmetrical distribution of power between firms. The initial taxonomy developed in this context distinguished between buyer-driven and producer-driven commodity chains (Gereffi and Korzeniewicz 1994), later to be refined into a typology of global value chain governance models (Gereffi, Humphrey and Sturgeon 2005). While such taxonomies have proven useful to identify and analyse this important aspect of the distribution of power between firms within GPNs, the increasing complexity of contemporary production systems does not always conform to this limited perspective and scope of understanding of power relationships. While providing insight into some fundamental power configurations within GPNs, these types of chain-driving and inter-firm governance structures are still quite crude, obscuring the multiplicity of power relations between firms and non-firm actors within a GPN. Too often they do not include an appreciation of power relations in GPNs extending beyond inter-firm exchange, and actors which also are crucial for the configuration, dynamics and governance of GPNs, namely states, non-governmental organizations, civil society and consumers (Coe, Dicken and Hess 2008). Meanwhile, various firm and non-firm actors continue to engage with, and seek to assert their influence, within and against global production networks. States are implementing new forms of industrial policy, labour unions seek agency, and non-governmental organisations and civil society contest processes of value creation, enhancement and capture. Meanwhile global production networks continue to be subject to various economic, environmental, geopolitical, health, and security concerns. This being said, there has been some encouraging progress in developing more nuanced understandings of power, governance and governmentality in GCC/GVC/GPN research (cf. Gibbon, Bair and Ponte 2008; Ponte and Sturgeon 2014). Arguably, however, there is still a need to explore in more detail the topologies of power that (re-)make the spatialities and temporalities of GPNs and the different ways of “thinking through the capacity of different social actors to configure space-time presences and absences in particular ways” (Latham 2011: 313). Because power exists and is exercised in different forms and by different types and configurations of actors, a broadening of our understanding of power in GPNs is necessary for deeper analyses into the origins, dynamics and evolution of global systems of production, consumption and waste. Inspired by the work on geographies of power (e.g. Allen 2003, 2011, forthcoming 2015; Collier 2009; Ong 2007; Ong and Collier 2008; Prince and Dufty 2009), this session aims to provide a platform for the investigation of various approaches to power (realist, networked, diagrammatic, etc.) in analyses of GPNs. Anyone interested in presenting a paper in this session should submit an abstract of up to 250 words to Martin Hess (martin.hess@manchester.ac.uk ), Rory Horner (rory.horner@manchester.ac.uk ) and Gale Raj-Reichert (gale.reichert@manchester.ac.uk ) by Friday 3rd October 2014. The global electronics industry is one of the largest industrial sectors in the global economy. It is highly competitive, innovative, and fast changing with short product cycles. Some estimate that the industry employs the most workers and generates more revenue than any other sector in the world. In 2010, it was estimated the industry had 18 million workers worldwide. Many if not most of the jobs in the electronics industry take place in factories in developing countries that have been outsourced by companies, in particular brand firms, from developed countries. The first countries to receive outsourced electronics manufacturing factories were Taiwan, Singapore, Malaysia and Thailand during the 1970s and early 1980s. These countries were followed by the Philippines, Indonesia, China, and more recently India and countries in Eastern Europe such as Hungary, Poland, the Czech Republic and Romania. The signing of the North American Free Trade Agreement also led to the development of large manufacturing facilities in Mexico during the 1990s. Today the majority of subcontracted and outsourced electronics manufacturing is done in Asia for its low costs, an established supply base, and close proximity to key consumer markets. China is the fastest growing electronics production country in the world. It is the world’s largest computer hardware producing country and undertakes 80% of basic component production for electronic goods. More than 60% of mobile phone production is also done in China. Consumer electronics face especially short product life cycles that can range from 3 to 18 months with a quick end-of-life- timeframe. The Apple iPhone is an example. When the iPhone was unveiled to the public in 2007 the time it took manufacturers to bring it to the consumer market was six months. Five years later, the time to market was less than two weeks. 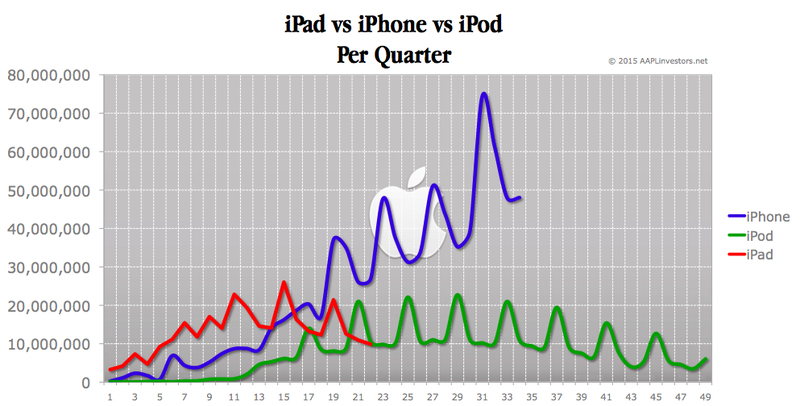 The following graph on the sales of different Apple products illustrates the volatility or the peaks and dips in short production life-cycles. Firms in developing countries that are outsourced by electronic brands such as Apple or Hewlett Packard can face delays in orders which further shortens their production times and often leads to increased use of over-time hours and temporary workers. As will be discussed in more detail below, the use of temporary workers has negative consequences on labour conditions. In Mexico around 60% of the electronics industry workers on average were estimated to be on temporary contracts from 2006-2007. During production peak times up to 90% of workers in some factories were on temporary contracts in 2011. In Hungary it was estimated that around 14% of workers in the electronics industry were on temporary contracts. During production peak times, individual factories have reported having up to 40% to 60% of its workforce made up of temporary workers. In these same factories, only 15-20% of the workforce was on temporary contracts during low production times. Temporary contracts in the electronics industry have been reported to be as short as one day or one week to three months to one year. Many temporary contracts are renewed continually resulting in workers remaining a temporary worker for many years or even a decade (which has been reported by some workers in Mexico). In Malaysia, for example, many temporary workers are foreigners from countries such as Bangladesh, Nepal, and Cambodia that are employed on temporary contracts that last between three to five years. Companies utilise temporary workers also to lower their costs of production. Temporary workers often do not receive equal pay, benefits, and treatment like permanent workers. Temporary workers receive lower wages than permanent workers (this is also the case in other sectors beyond the electronics industry). This was the case in Hungary where temporary workers received wages that were up to 30% lower than permanent workers with the same job and qualifications in the same factory. Temporary workers also miss out on receiving wage increases, lack pension payments, and often receive no compensation for job loss or for death on the job. Temporary workers that are hired through temporary worker agencies (TWAs) can face high recruitment fees. In Malaysia, there are cases of foreign temporary workers having significant portions of their wages taken away from them in order to pay off recruitment fees to TWAs. Some workers even enter into debt after the end of their temporary contracts or have not been able to leave their jobs in order to earn enough money to repay their debts – resulting in bonded labour. Temporary workers, particularly those with contracts from TWAs can face various violations to their rights. For example, temporary workers are often prohibited from joining a trade union. Some temporary foreign workers face serious human rights violations by having their passports retained by TWAs or companies. This has been a common practice in countries like Malaysia. At the most basic level, workers on temporary contracts face job insecurity on whether their contract will be extended or renewed. Insecurity over continuous income presents difficulties for managing a household that require regular payment of services (electricity, school fees, etc), food and clothing purchases, and family planning. This is particularly difficult for workers who have dependents. Evidence also shows a gendered aspect to temporary employment. Women tend to stay on temporary contracts longer than men. Job unpredictability and insecurity for women can lead to conflicts at the household level for example over division of household tasks, create relationship pressures, lead to domestic violence, increased stress, and negative health implications, and force premature independence of their children. Women on temporary contracts in the electronics industry also often do not get their contracts renewed if they become pregnant, get married, or reach a certain age. This is the case in countries like China, Thailand, Indonesia, and Malaysia. During economic downturns, temporary workers tend to be the first ones fired. Companies also invest less on temporary workers for training and job skills development. This can have long-lasting detrimental effects on young workers who miss out on receiving the necessary training and skills early in their careers that are needed throughout their working lives. Ways to reduce the use of temporary workers in the electronics industry will likely require a multi-pronged approach. First, brand firms that outsource to suppliers can better coordinate their planning of orders in order to reduce or minimise production volatility. There is currently however very little interaction between buyers or brand firms and suppliers on the use of temporary workers. A recent study conducted by Not for Sale and Baptist World Aid Australia, found that out of 39 electronics brand companies surveyed only 12 monitored the use of temporary workers by their suppliers. More fundamentally, buyer-supplier coordination must confront the implication of short product cycles on labour conditions. Second, is to set a limit on the use of temporary workers in factories. There have been suggestions made of setting a ceiling of 30% temporary worker usage outside of production peaks by an electronics industry group and nongovernmental organisations. However, maintaining this limit continually (i.e. throughout the production cycle) would better help prevent temporary worker abuses and poor labour conditions from occurring in outsourced factories. Third, is to allow temporary workers to join trade unions so they can exercise their right to engage in freedom of association and collective bargaining for equal treatment on pay, benefits, and working conditions. Fourth, is to develop government legislation on the use of temporary workers. The European Union recently passed a Directive on Temporary Agency Work (2008/104/EC) with equal treatment clauses (though with exceptions and deviations) on working conditions, pay and other issues concerning temporary workers employed by TWAs. In the United States President Obama recently signed the Executive Order – “Strengthening Protections Against Trafficking in Persons in Federal Contracts” which prohibits the use of forced labour, including bonded labour (this would include workers that have their movement restricted by having their passports taken away from them or by other means), in any goods or services used by the US government that is procured by federal contractors and subcontractors in the US and abroad. These issues will be discussed by companies, trade unions, and governments at the Global Dialogue Forum on the Adaptability of Companies to Deal with Fluctuating Demands and the Incidence of Temporary and Other Forms of Employment in Electronics from 9 – 11 December 2014 at the International Labor Organisation in Geneva, Switzerland. Check out the Relevant Publications link. I’ve added a couple of new publications, particularly interesting are the ones from Richard Locke (who is now at Brown University). Also check out my Twitter feed @GaleRajReichert for updates on the electronics industry and labour issues.